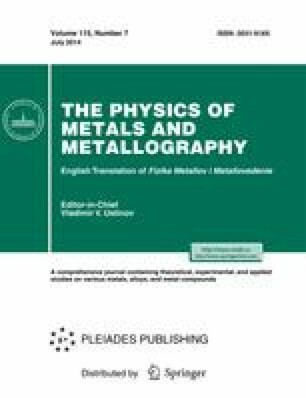 We present the results of investigating the effect of annealing on the magnetostrictive characteristics of a grain-oriented electrical steel (GOES) with ordinary and refined domain structure. Not infrequently, the annealing of sheet samples leads to an increase in the electromagnetic induction B 100 and, simultaneously, to an enhancement in the specific electromagnetic losses P 1.7/50. In a GOES with a refined domain structure, the minimum absolute values of λ0-peak and λpeak-peak are observed before annealing. For these samples, after annealing, the magnetostrictive characteristics are impaired most severely. The mechanism for explaining this experimental fact has been suggested. Original Russian Text © A.A. Redikul’tsev, G.S. Korzunin, M.L. Lobanov, G.M. Rusakov, L.V. Lobanova, 2014, published in Fizika Metallov i Metallovedenie, 2014, Vol. 115, No. 7, pp. 691–696.